The Federal Aviation Administration (FAA) has issued an airworthiness directive (AD) for the Boeing 787-8 and 787-9 airliners powered by General Electric (GE) GEnx-1B engines. The AD revealed that a Boeing 787 Dreamliner reported a recent in-flight incident in which an engine fan blade rub event caused an engine to shut down while the plane cruised at 20,000 feet. The nature of the power loss did not allow the flight crew to restart the engine. The plane has only two engines, but the flight crew was able to land safely, using the single working engine. “The urgency of this issue stems from the safety concern over continued safe flight and landing for airplanes that are powered by two GEnx-1B PIP2 engines operating in a similar environment to the event airplane,” the FAA said. There are 43 Boeing 787s in service in the U.S. The FAA directive does not cover international airlines, but it is common practice for them to follow directives from the American flight agency. The Dreamliner is the latest Boeing jetliner; it is built with lightweight materials to give it greater range and fuel efficiency. The plane received final certification in August 2011 and entered service with its first commercial customer, All Nippon Airways, in October of that year. The Boeing 787 launch has not exactly been a smooth one. In January of 2013, the FAA grounded Dreamliners operating in the U.S. while it investigated problems with its lithium-ion batteries. Two incidents involving 787s operating in Japan released flammable electrolytes, resulting in heat damage and smoke. The FAA warned that these conditions could result in damage to critical systems, such as fire in the electrical compartment. 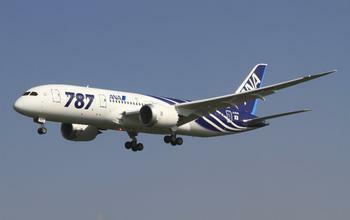 In the case of the latest AD, the FAA has not ruled out that some 787s could be grounded. However, Boeing says it is working with GE to resolve the issue.